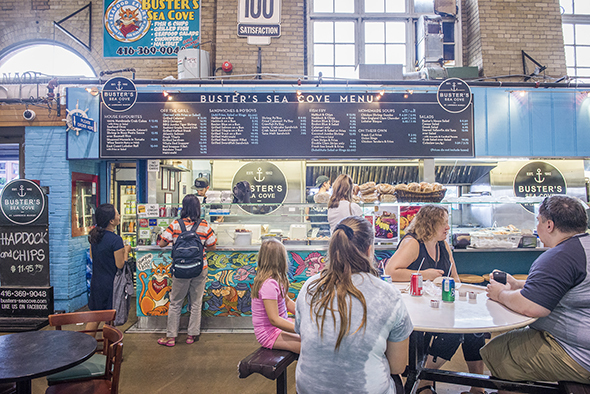 Buster's Sea Cove is a popular St. Lawrence Market lunch counter found against the southern wall on the main floor of the historic market building. 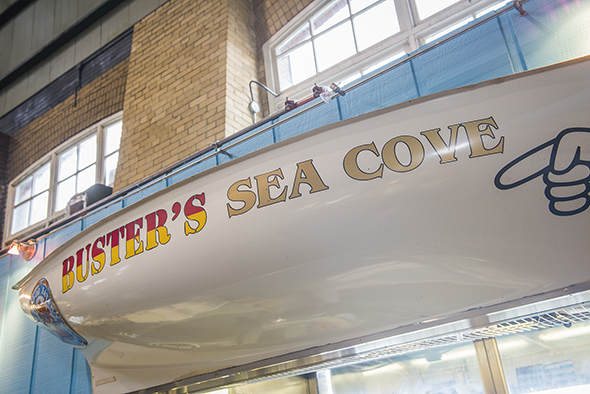 First established in 1992, the seafood dealer is the only one in the market cooking up seafood to order for immediate consumption. Ordering is a chaotic experience but that's all part of Buster's charm. It's a cash only operation and while this fact is advertised clearly next to the menu, it's not unusual to see tourists making a panicked dash for cash. Once orders are in, soon-to-be diners must hang back in purgatory, a sliver of space that exists between the sizzling kitchen and a scattering of tables populated with people already mowing down on crab cakes ($13.95) and slurping back bowls of chowder (from $2.50). The lobster roll ($15) is among the house favourites and a dish that I am personally no stranger to. 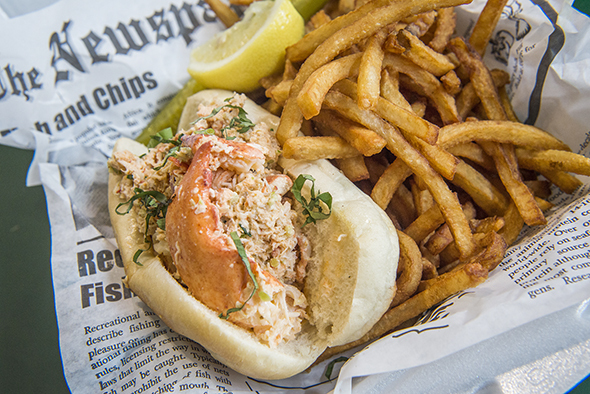 Starting with a toasted white hot dog bun, a generous scoop of cold and creamy lobster salad is piled on top and then crowned with a few big chunks of claw meat. 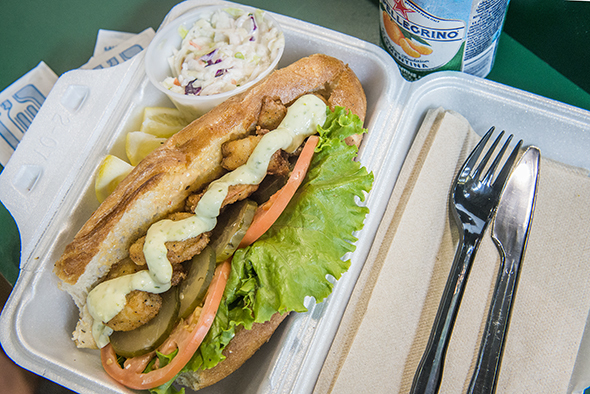 Buster's Food Truck has made this East Coast sandwich, served with a pickle and a bag of Mrs. Vickies, a staple at street festivals throughout the GTA. 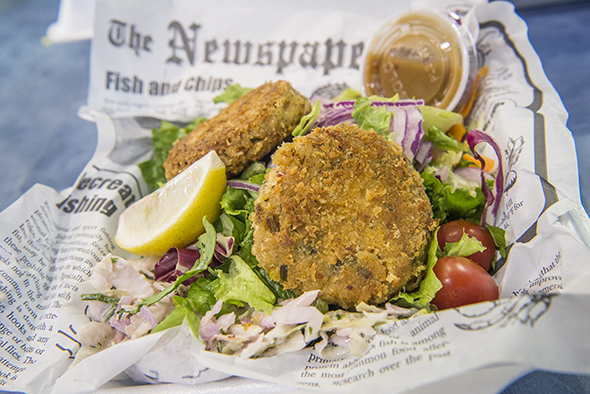 Here at the OG fish counter, it comes with a choice of fries or salad instead of chips. 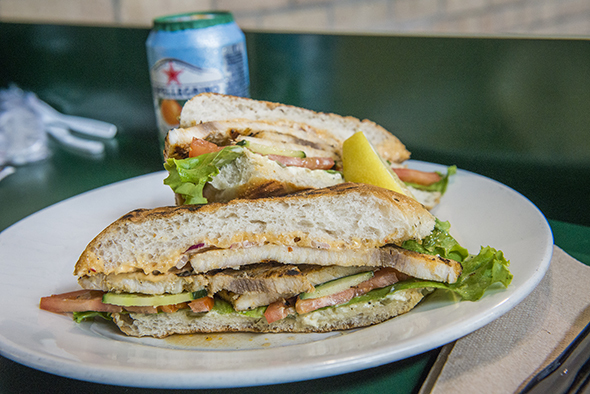 Other popular picks from the roster of sandwiches include the shrimp po'boy ($9.95) and the swordfish sandwich ($10.95). The former is a fine example of the deep fried delicacies offered on a bun, while the later showcases meaty slices of grilled fish and represents some of the lighter selections available on the menu. 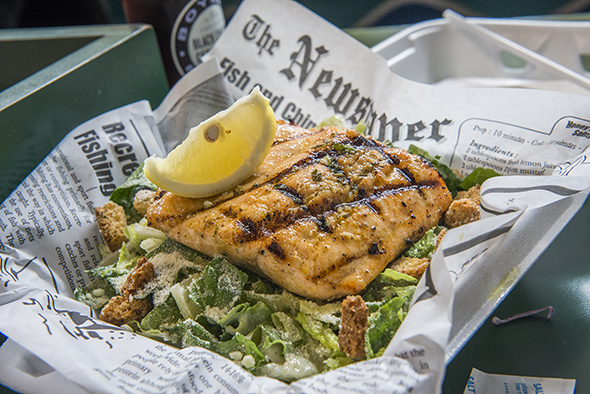 Speaking of lighter selections, the grilled rainbow trout over salad ($15.95) almost counts as diet food were it not painted with garlic butter...not that I'm complaining. 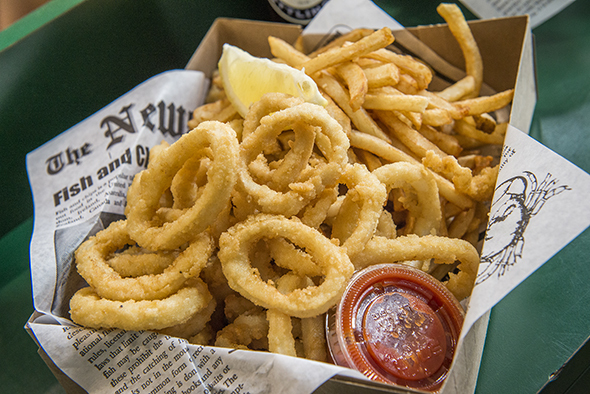 Those who really want to indulge should eye the fish fry boxes, overflowing with crispy, golden fries and selections like fresh halibut ($13.95), sea smelts ($10.95) or rings of calamari ($10.95). Weather permitting, I like to take my food outside. Picnic tables on the raised patio offer a chance to eat in a quieter and less hectic surroundings.